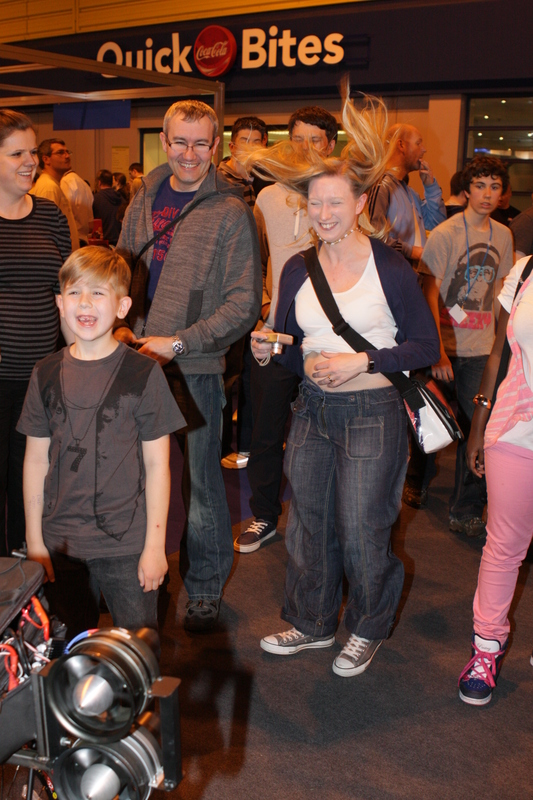 Gadget Show Live has been and gone for another year, and this year I actually managed to go. I spent my Saturday immersed in a tech filled world. And what a world it was – 3D television, robots galore, stuff that made noise, and tech that was pretty pointless but fun. The show by the Gadget Show presenters was really fun and entertaining. A friend of ours managed to get in one of the challenges to win tech, but was beaten by a young lad in the photo challenge – shame, there was a £1k camcorder up for grabs! The iPhone “tested to destruction” was brilliant (I’d have feinted if it had been mine I think!) and the playing of Heli Golf (the crowd-game version) was excellent (we won Jason!!!)! Oh and I should mention the performances from Ortis and Pollyanna as part of the challenge that will be aired on Monday night’s Gadget Show were both awesome – way to go the pair of you, I know who I voted for, can’t wait to see the final results! I found the eye controlled gaming at National Instruments fascinating. The demo was wack-a-mole which is played by simply looking left, right, up or down. Papershow was intriguing… turning any piece of paper you’re using into a drawing tablet. The Dyson fan isn’t new but it really works and looks stunning… would love one in my lounge. There were loads of sound companies at the show – Denon, Sennheiser, Bowers and Wilkins etc. Because of my love of music, speakers and headphones are important, and it was great to listen to what these top brands have to offer in price ranges beyond my reach. One of the surprises for me was the air filled tent by Vango. No poles – just air. If I was in the market for a tent right now then this is the one I would want right now – so easy to put up, no poles to carry or snap, such a good idea. Mitsubishi had their electic car on show… something I am looking forward to watching develop over… I love cars but we have to find ways to reduce fuel consumption. The prize for most pointless piece of tech I came across was this telephone handset for your… er… phone! Connect it to your mobile with the 3.5mm jack and it becomes your house phone. You can even answer and hang up using the button on your retro handset. The company selling these had a long list of reasons why you needed one of these – but the fact is it’s pretty pointless but fun. The most fun on a stand definitely goes to Firebox for their Angry Birds set up. Members of the public were invited to throw Angry Bird plush toys at a coconut-shy-type set up. They even had the Angry Birds music playing in the background. Whoever came up with this idea is genius. Obviously there was loads of other stuff to look at too. I enjoyed having a go with the 3D camera and television on the Sony stand, and looking at all the bikes and remote controlled toys on display. It was great to be able to chat to people about the tech – people who obviously love what they do in their gadge-filled world! There were a couple of things about the show that annoyed me… Well not annoyed me but things that I would want to see improved for next time. One was the half an hour queue to see the Nintendo 3DS – which I obviously didn’t join because there was other stuff I wanted to see and do. This of course means I STILL haven’t had a play on one. I wish they would have had more and that the stand wasnt quite so secretive (it had four walls and an entrance/exit door so I couldn’t even look over someone elses shoulder while they had a play). Actually the gaming zone was absolutely rammed – much more space (between the stands) needed next year. Race Room were charging £5 a go on their games, which considering we’d paid good money to get in was a bit exessive. And others must have too as on their stand there were empty consoles – something you didn’t see anywhere else. The gadget show should be about trying stuff out, getting a hands on experience, not putting barriers in people’s way. A not-very-honourable-tactics mention goes to NPower… two or maybe three stands… stopping people as they walked by, stopping kids even and getting them chatting to get to the parents. Er no, we don’t want to switch energy suppliers we’re at a show about tech, and please stop using children as part of your sales pitch! I’ll definitely be back for more gadge next year. I’d be tempted to go for the first day of the show and for premium seats at the show. Or maybe I’ll try for a press preview pass?! Fab review. You saw stuff that I didn’t see! Just shows how much there was to ogle at. I agree with you on race room charging a fiver! Outrageous, and as for the phone for the iPhone (I did see those) mad but fab lol. I’m deffo back next year and hopefully get to see the theatre show which we missed out on. Oh and being there on Sunday till the end we got loads of freebies from the firebox stand as they didn’t want to take stuff home!